Nails are potent symbols. Long, beautifully decorated nails are associated with glamour, health and femininity. On the other hand, nails can also be edgy and aggressive like claws. 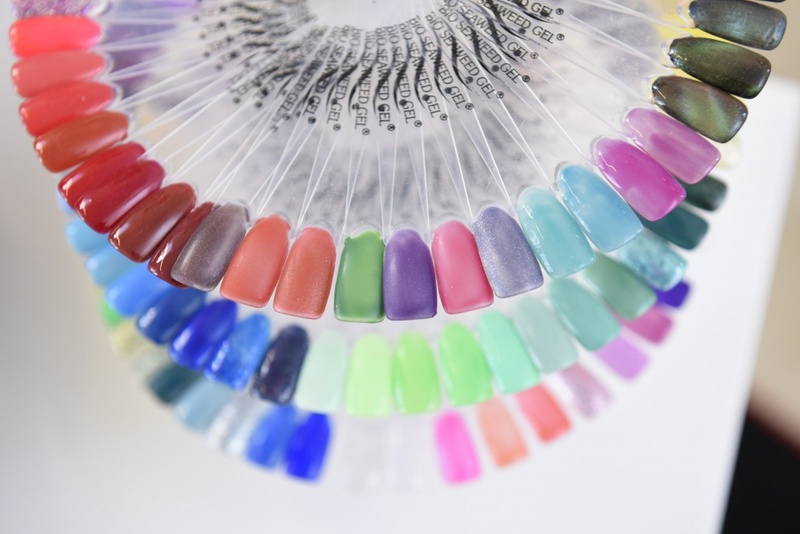 The state of your nails reflects wealth and social status. Whether they are chewed, clean, dirty, long, short, painted or decorated with art is all sending signals to those around you. 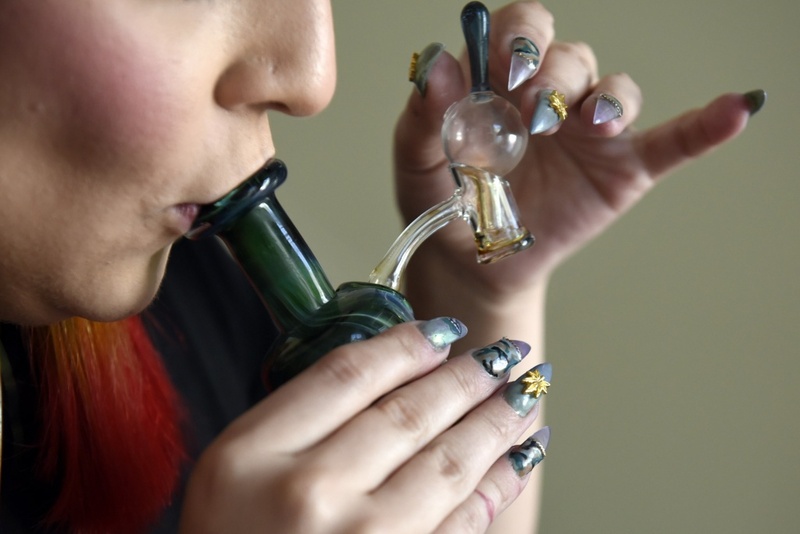 And nowadays, nails can signal a woman’s relationship to cannabis. 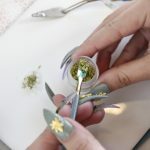 From tiny canna-inspired designs like pot-leafs and dripping oil to nails that actually contain marijuana leaf bits, all you need to do is search #weednails on Instagram to see how many people are switching up their style to embrace the cannabis nail art trend. 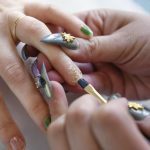 In the San Francisco Bay Area, this trend is exemplified by leading cannabis nail artist Christina Blea, AKA Dabulous. 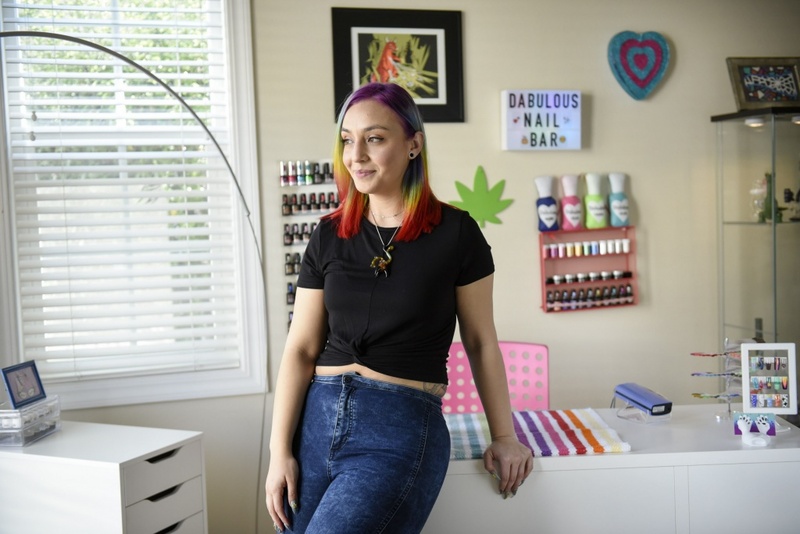 Her herb-themed designs can be found on the hands of some of the cannabis industry’s favorite it-girls and influencers, such as Instagram sensation Coral Reefer, cannabis party planner Elise McRoberts, and blogger Dani Walton. 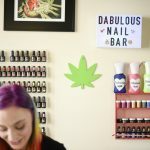 To learn more about this growing trend, I visited Dabulous for a weedicure and interview at her in-home nail studio in Point Richmond, a district of the East Bay city of Richmond, near Berkeley. 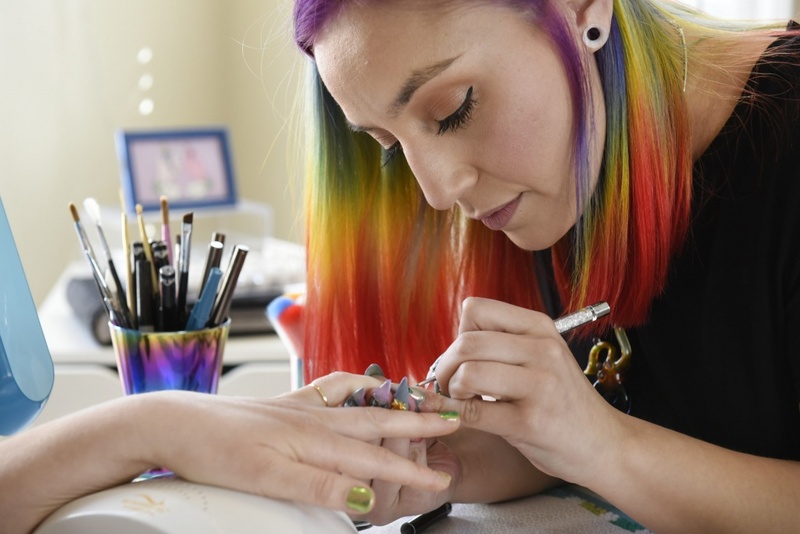 She met me at the door with a friendly smile, rainbow hair, and long, intricately designed nails, complete with gold cannaleaf charms. I have to admit, I wasn’t sure what to expect from the weedicure. 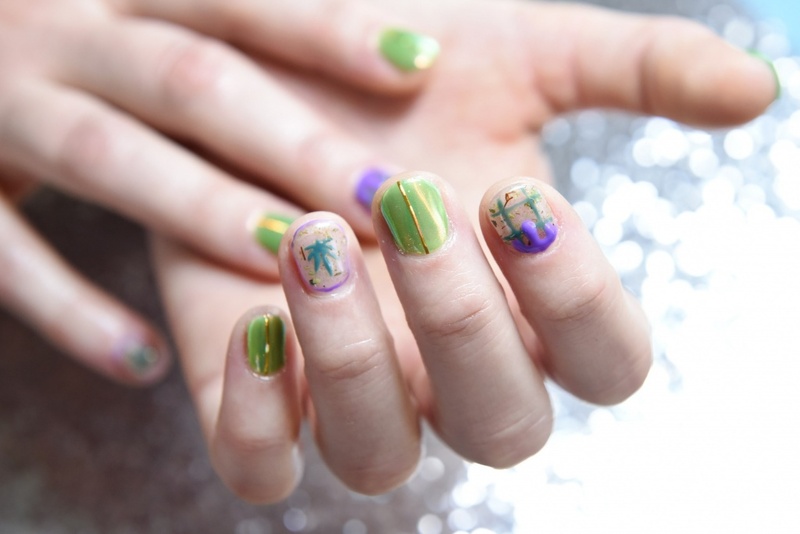 The whole notion of decorating nails is an interesting one. 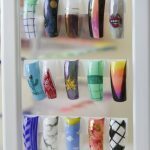 Nail polish dates to China in 3,000 B.C., but trendy, modern nail art has come into vogue only during the past decade or so, thanks to pop stars such as Rihanna, Nicki Minaj and Katy Perry, who have gone beyond solid colors and French manicures and turned their fingertips into modern art canvases — with fans and others following suit. 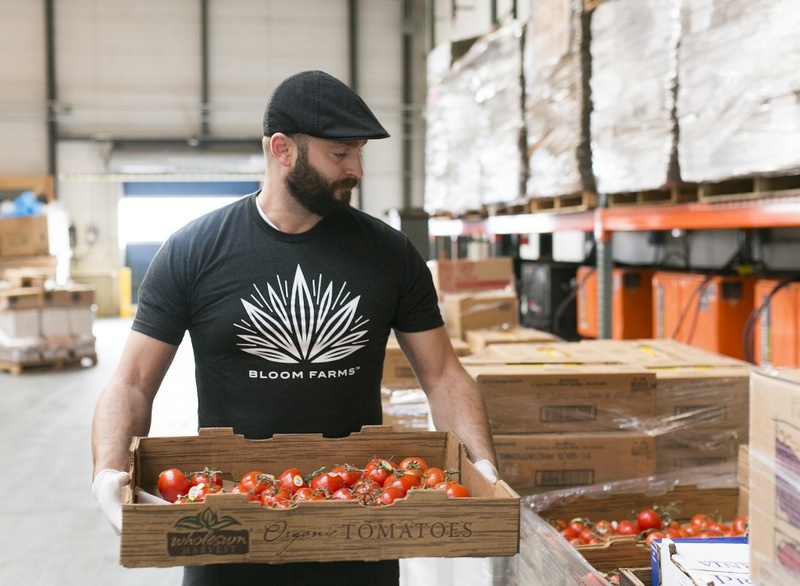 Cartoons, national flags, checkerboard patterns, splatter paint, animal prints, metallics and even words and logos are among the designs commonly seen among those who use the medium to express themselves — and then show them off on social media. 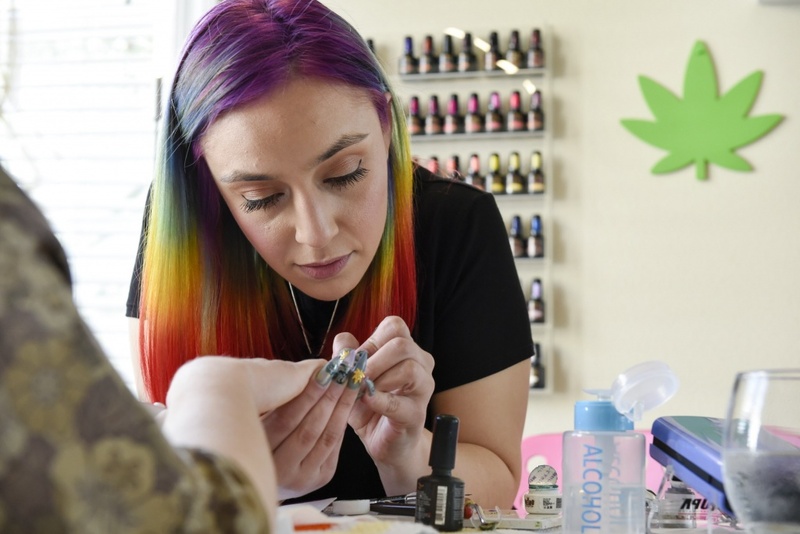 The sub-trend of cannabis nail art is just getting started and it couldn’t be better timed with the beginning of legal recreational cannabis in California. My own relationship to nails has always been conflicted between art and functionality. I usually rock short, unpainted nails, and have never used fake nails. Part of this is my style; I use some makeup but tend to go for a natural look and long elaborate nails just don’t fit. But mainly, short unpainted nails are about functionality. I’m very active with my hands. 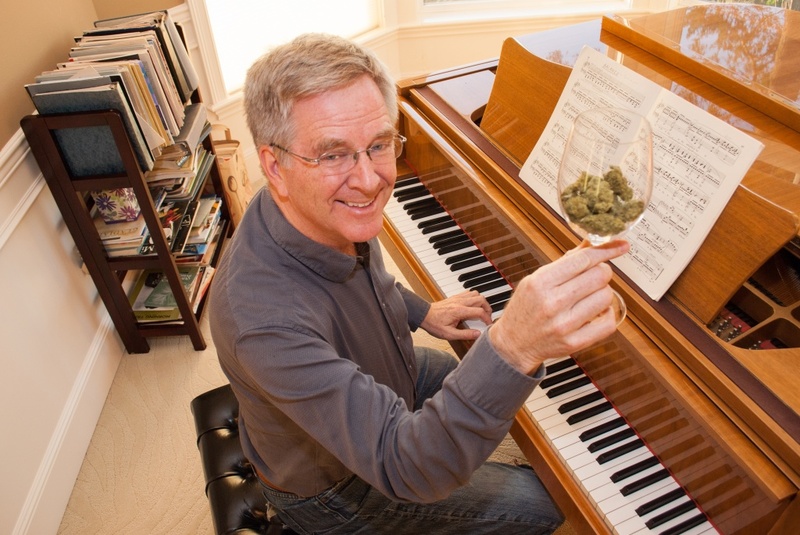 I type, I paint, I play guitar, I roll joints, I rock climb. Even slightly long nails have always gotten in my way. 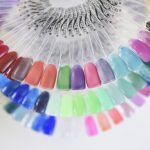 Don’t get me wrong — I love seeing a beautiful color and shine on my nails. Sometimes, I will put nail polish on for a special occasion, but I don’t like to spend time worrying about chipping my nail polish (much less breaking a nail) on an everyday basis. 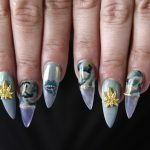 I was open to trying out long nails, but Dabulous assured me that cannabis nail art could work on all lengths of nails. 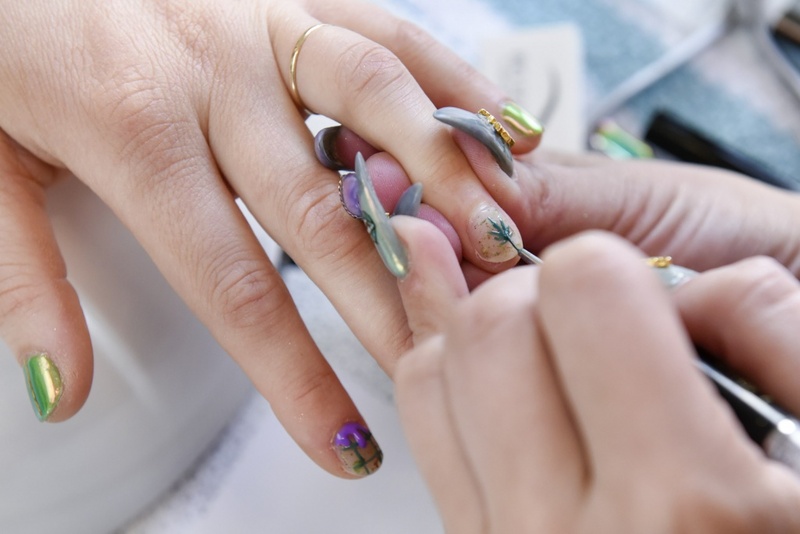 “Natural nails can be really cool and we can do really awesome things to them,” she explained. She suggested we stick with my natural short nails. After a brief conversation about my color and design preferences (I told her I like metallics and neutral tones, and asked her to highlight her best cannabis motifs) she went to work, creating a design layer by layer. 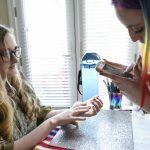 Her pricing is pretty reasonable, starting at $45 for shorter, simpler nail designs and going up to $100 for the most elaborate nail art she offers. 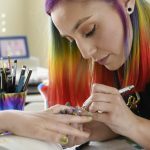 Since most nail artists I’ve used in the past did their work wearing short bare nails, I was amazed by how dexterous Dabulous was, with her flawlessly decorated long nails. Unlike me, she says she functions better with her long nails now that she is used to them. 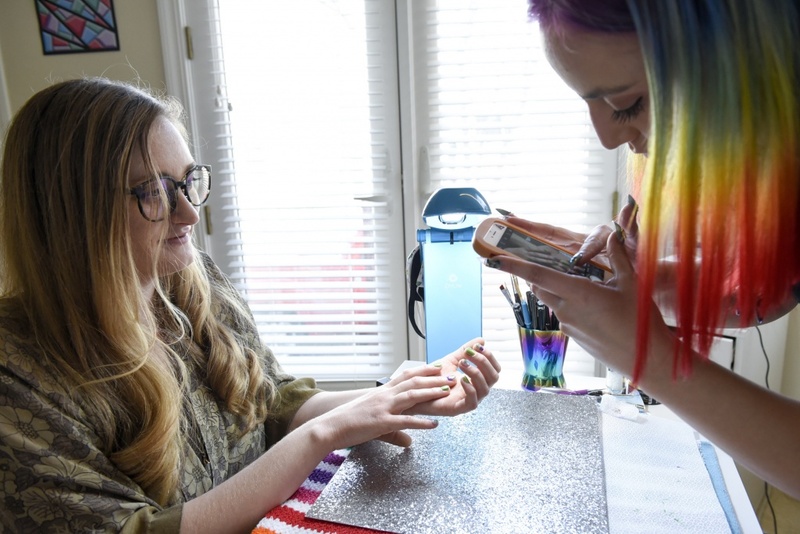 Because she uses gel for her nail art, she can easily wipe any spilled polish off before it sets. 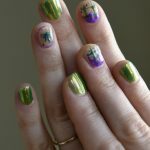 Whatever her reasons, it was inspiring to see her already-complete design as she worked on my weedicure. The most exciting part of the process came when she pulled out the cannabis. A tiny container of bright green bud appeared and she pulled off the tiniest piece, crumbling it up into a light, kiefy dust. 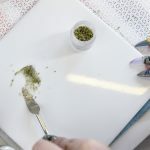 The cannabis encasing gel looked like a mess at first, but after the gel hardened, she buffed down the hard bumpy glob into a smooth and sparkly nail. The distinctive tiny green specks and orange hairs were encased in my nail like glitter. It was clearly cannabis, and it looked beautiful. 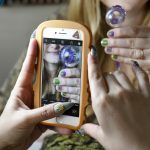 As Dabulous continued to work on my nails, adding layer after layer of details, we talked about her life and what got her started with cannabis nail art. 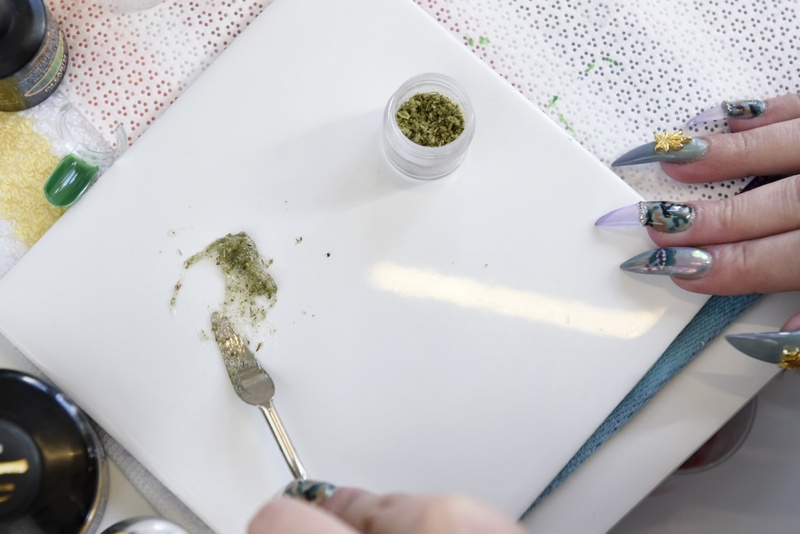 Dabulous says she first got into the cannabis scene while working at a high-end smoke shop and admiring the beautiful cannabis artwork that glass artists were creating. 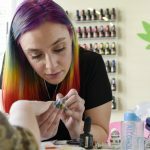 This inspired her to create a line of cannabis-themed nail polish called Dabulous. 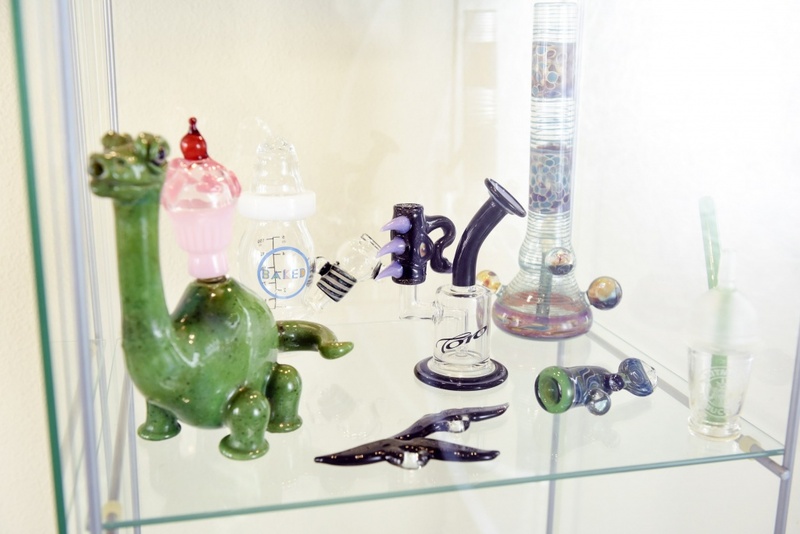 “Dabs” are slang for high-potency cannabis hash enjoyed through a water-filtered pipe. 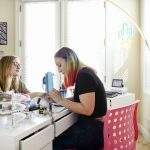 “I started doing a lot of nail art on myself just to promote my products online and on social media,” she explained. That was about four years ago. While the polish line didn’t last, the requests for weedicures started to pour in. 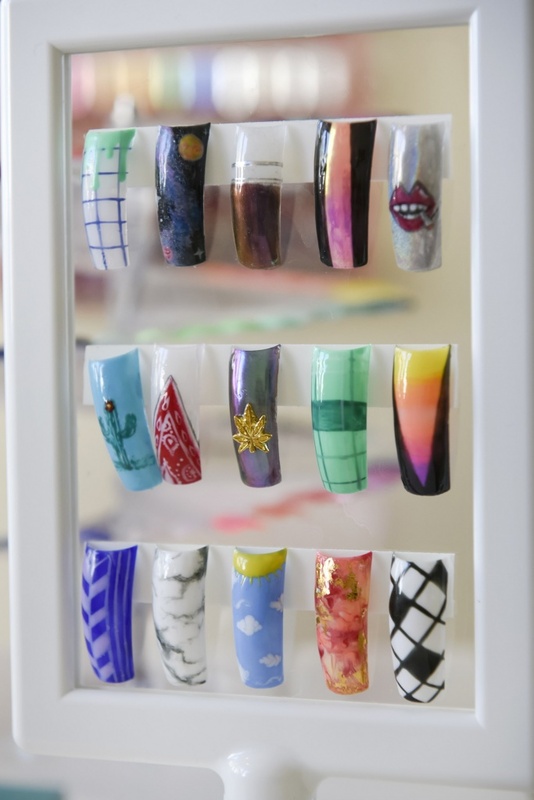 Now 25 and licensed for the past two years, Dabulous has regular clients who frequent her in-home nail bar. 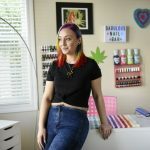 She says her clients, most of whom find her through Instagram or word-of-mouth referrals, range from cannabis industry professionals to women who are interested in the cannabis lifestyle. 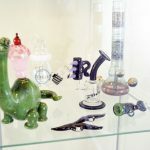 These clients might request anything from a simple pot leaf design to a nail encasing real cannabis or cannabis concentrates. 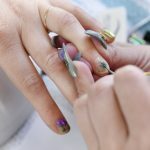 Since this is a relatively new trend, Dabulous says she’s often using classic nail art techniques with cannabis mixed in and many times she’s trying out these designs for the first time. 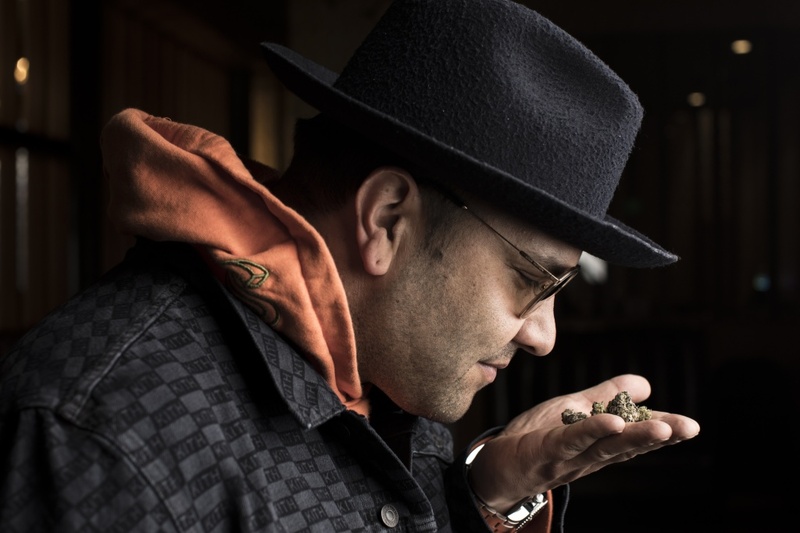 Cannabis can come in a variety of colors and textures, including near-pure extracts that look like crystals. When a client has a new idea or request, Dabulous turns their weedicure dreams into reality. 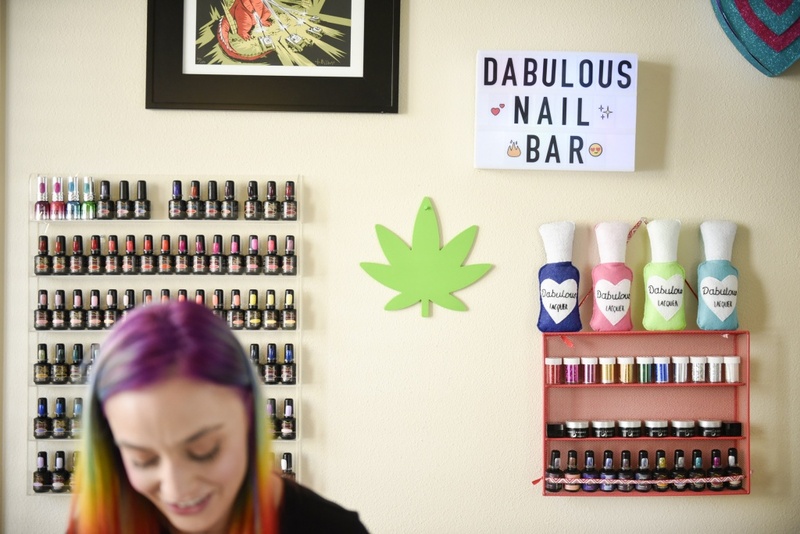 As for Dabulous, she dreams of having her own salon — one where cannabis is included in all the services. 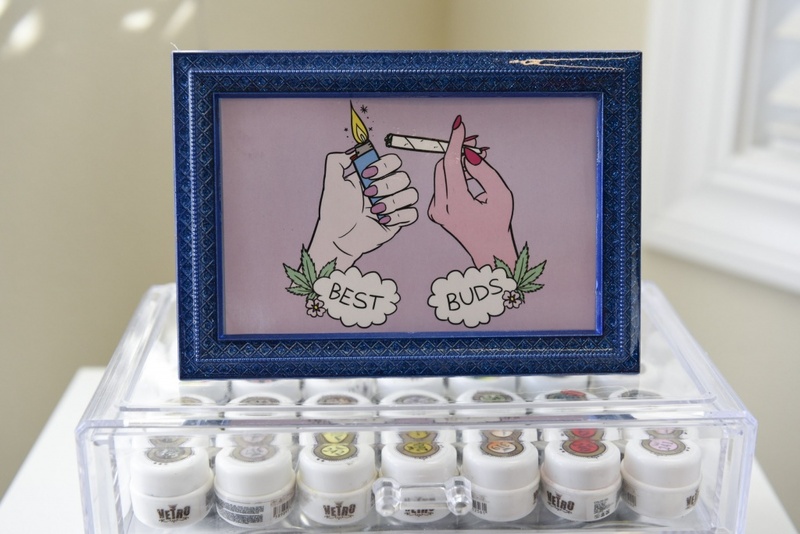 From weedicures and CBD lotions to cannabis bath bombs and cannabis-infused beauty lines, the possibilities are endless. My weedicure only took about an hour, and the fact that I could use cannabis during the session made it go by more quickly. Dabulous had a big case of dab rigs and a box of concentrates to choose from, which she generously shared. I picked a heavy indica dab that tasted like strawberries. It left me feeling relaxed and social, which was perfect for our session. When it was done, my nails looked about as fierce as my short nails ever have. 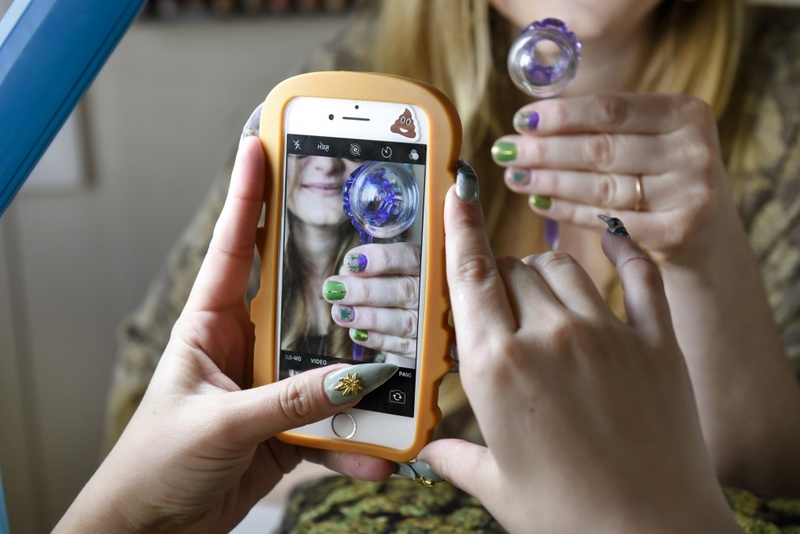 The weed encapsulating nails now sported cute little cannabis leafs, or a dripping oil design. The rest of my nails were color-changing and chromed with a gold stripe running down the center. My natural short nails were popping, and while they weren’t my usual look, I couldn’t wait to show them off. 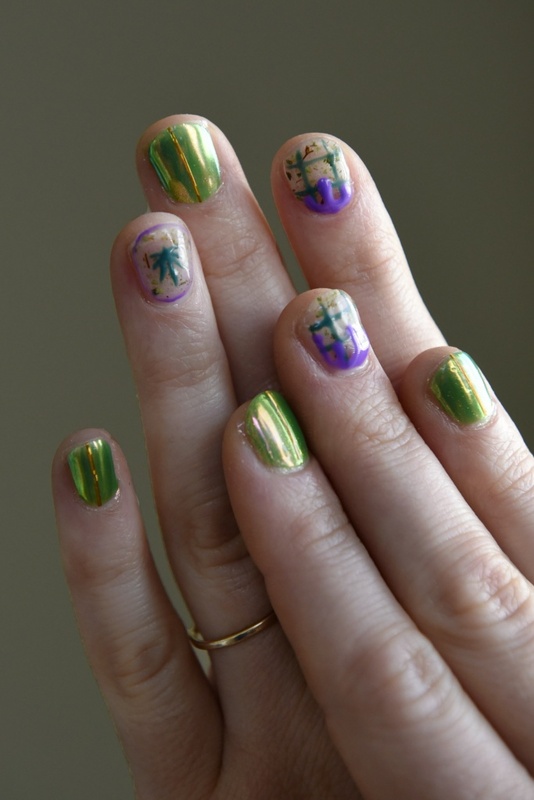 In the days after, I noticed how much I enjoyed having the bright colors and imagery on my nails. It wasn’t as much about showing them off as it was enjoying them myself. It made everyday tasks like using my phone or rolling and smoking a joint look so much more beautiful and polished. Still, even at that short length, they were too long for me to go rock climbing. It was only a few days before I had to ruin the beautiful finish by cutting my nails. 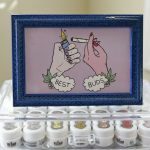 Nail art (cannabis or otherwise) might not fit into my everyday life, but I think I will go back to Dabulous for special occasions. 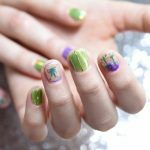 Even over the few short days, I had many moments of joy looking down at the cannabis artwork on my nails — and my mind is full of other designs I’d like to try out. 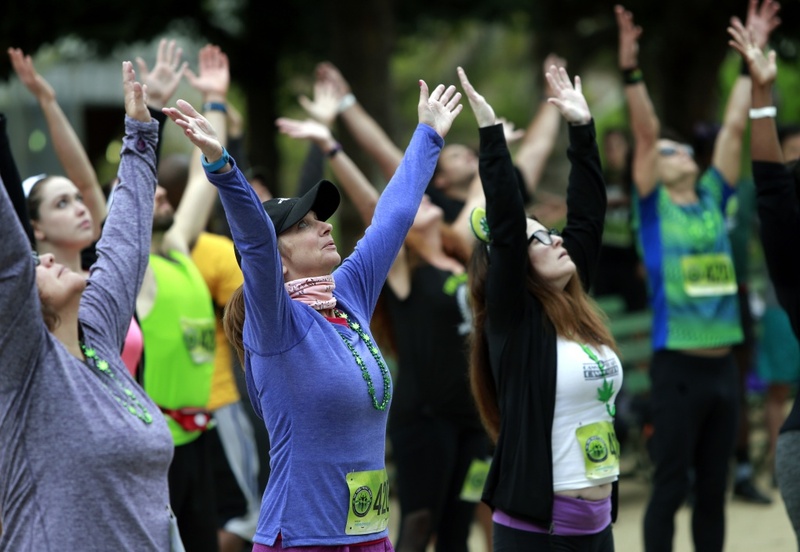 Emily Earlenbaugh is a freelance writer based in the San Francisco Bay Area of California. 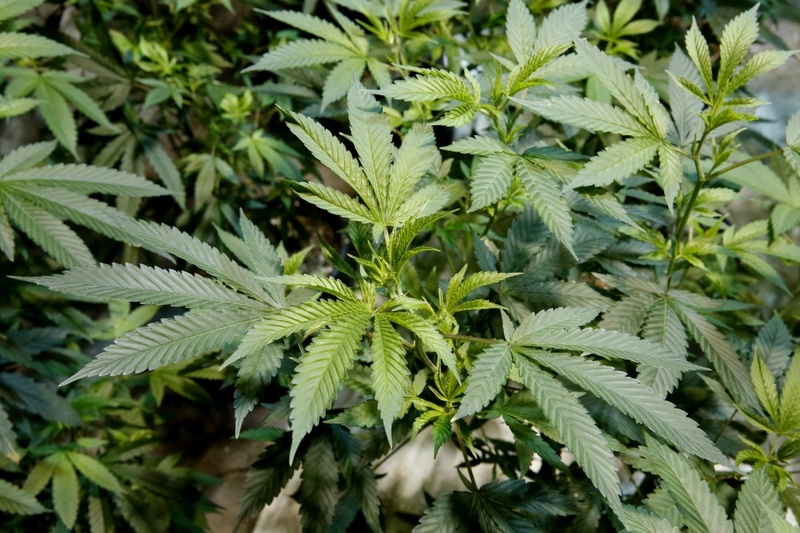 Moe Greens leads the pack of cannabis lounges in S.F.